Despite a valiant effort, The Brave TV show has been cancelled by NBC. In this instance, the 13-episode first season wasn’t a sign of certain cancellation, as a shorter season aways the plan for this series. In November, after some early gains in the Nielsens, the Peacock Network was even touting the show’s ratings, but they later dropped off and weren’t strong enough to score a season two renewal. 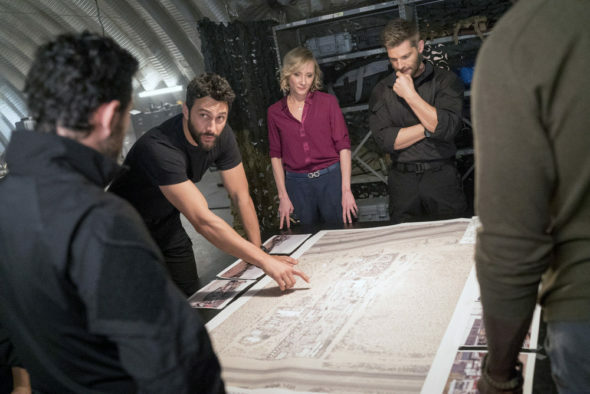 An NBC military drama, The Brave stars Anne Heche, Mike Vogel, Natacha Karam, Demetrius Grosse, Noah Mills, Hadi Tabbal, Tate Ellington, and Sofia Pernas. The series centers on Captain Adam Dalton (Vogel) who leads his Special Ops squad on dangerous field missions across the globe. Back in their Washington D.C. headquarters, D.I.A. Deputy Director Patricia Campbell (Heche) oversees the unit which provides support and analysis for Dalton and company. The first season of The Brave averaged a 0.92 rating in the 18-49 demographic and 4.62 million viewers. Find out how The Brave stacks up against other NBC TV shows. The Brave cancellation has been confirmed by Deadline, which notes three military dramas premiered on broadcast networks, this year. Although both The Brave and Valor (The CW) were cancelled, SEAL Team was renewed for a second season on CBSCBS. What do you think? Did you like The Brave TV series? Did you think NBC would cancel or renew it for a second season? Great show! It should of had a second season. One of the best shows. Disappointed and surprised it was cancelled. Would be great if it was brought back. This was a good show. Considering there were so many shows to watch, this show had potential. Really disappointed that this show was cancelled. Yes, too many of this type showed up at the same time – and watching more than one can be too much of the same, so I’m not surprised that one or more would have to be cancelled. I like Seal Team, but this show was better – higher quality in every way. I am hoping it can be re-constructed at a later date. I have waited for this show return. So disappointed. I enjoyed The Brave and was looking forward to a second season. Its story lines seamed to focus on under cover ops (infiltration of the ememy) which i thought set it apart from the dramas Seal Team and Six. Amongst the shows I’d rate them in this order: 1. Seal Team 2. The Brave 3. Six 4. Valor (did not watch Valor; my capacity for special ops shows was saturated). Season two of Seal Team has been steller. This was one of THE BEST molotary shows for someone to come up with and then cancelled how stupid!!! Alot of others feel the same way. It is an insote of todays world helping people to understand the real danger out guys and girls through!!! BRING IT BACK!!! I really liked this show. It was well acted, well scripted and just an all around great show to watch. It was a very STUPID idea to cancel this show. They need to seriously think about bringing it back. They ought to cancel the show SEAL TEAM, that show is awful.